Now that was vintage Michigan football: injure the opposing quarterback and grind an opponent to dust on defense. Illinois is terrible, but beating them that summarily is still fairly astonishing given the relative talent levels on defense. Even when michigan beat Minnesota last year--a squad in contention for the worst Big Ten team of all time--the Gophers still managed 177 total yards, good for 3.76 yards per play. 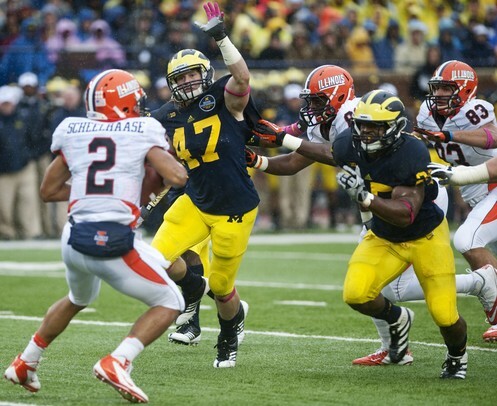 Against Illinois on Saturday, Michigan's defense held the Illini to 134 yards on 2.5 yards per play. The Wolverine secondary allowed Illinois' two quarterbacks to complete only 7 of 16 passes for 29 yards. 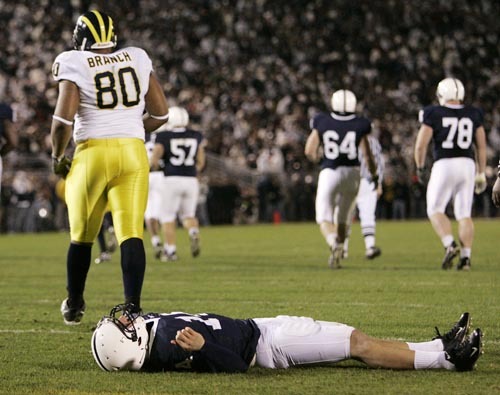 The last time Michigan's defense beat a D-I opponent that badly was probably the 2007 Notre Dame game in which they allowed the Irish only 79 yards. Defenders on that team: Terrance Taylor, Brandon Graham, Tim Jamison, Morgan Trent, Donovan Warren, Shawn Crable, Stevie Brown, and Jamar Adams, among others. There's not much else to say about this game. Michigan beat Illinois at every position, all game. The only thing that slowed Michigan's offense was the non-injury to Denard and two drops by Michigan's receivers on passes thrown by Russell Bellomy. If those catches are made, the Denard injury probably won't even stop Michigan's offense. Fitz Toussaint didn't look great, but that's the only negative that can be taken from this game. Despite much of the Big Ten schedule left to play including games against Nebraska, Michigan State, and Ohio State, it may be time to start considering Michigan as the best team on both sides of the ball in this conference. Though the Buckeyes just beat up on Nebraska and Indiana, they were still only able to manage 17 points against Michigan State--approximately as much as Iowa did against the Spartans. MSU's defense, meanwhile, has allowed 27 points to Indiana and 20 to a probably bad Notre Dame offense. Though I hate this kind of transitive property assumption, the performances in-conference to date point squarely at Michigan being the most well-rounded team. With the transformation of the defense this year and last, we can be certain these aren't outlier performances. And with a healthy Denard being on the same page as Al Borges, the sky is the limit for the offense. Make no mistake the 2007 Michigan team would still beat 2012 Michigan to a pulp, but these past two years have been two huge steps to getting this program back to where it's supposed to be. Injured quarterbacks for all! So maybe it's time to start panicking about Toussaint. Despite having blockers in front of him all game, he kept trying to break a run to the outside rather than taking the yards he was given and keeping Michigan ahead of the chains. I don't know why he's been so impatient this season--perhaps he's just stir crazy from early in the year--but it's becoming a problem. For the game, he managed just 62 yards on 18 carries. Denard completed 7 of 11 passes for 159 yards and no interceptions. Excise the 71-yard touchdown pass to Gallon and he throws 6/10 for 88 yards (8.8 YPA). Still good. One of the big changes in the last two games has been a relative dearth of deep shots. This is a good thing and the main reason Denard is playing this well. Dear Al, please continue this trend and don't freak out if Michigan gets behind in a game. Three of Michigan's top four tacklers: Jake Ryan (#1), Kenny Demens (#2), and Desmond Morgan (#4). You don't get to a member of the secondary (Kovacs) until eighth on that list, behind James Ross, even. Michigan's front seven is turning into something special. Speaking of which, Demens' interception showed the kind of anticipation and development you want to see from senior linebackers. Dennis Norfleet terrifies me every time he touches the ball. I have a standing rule: if you're a college football team taking field goals longer than 40 yards, you're going to lose that game. This is how Ohio State wins every close game, invariably forcing teams to kick 42-yard field goals (and missing) on 4th and 5. Michigan did this to Illinois in this game. They missed, because obviously they did. Michigan scored on their first two possessions and were basically only stopped because Denard got injured. Denard's rushing numbers weren't as high as they could have been because Michigan didn't need them to be. The same goes for his passing numbers: no need to throw the ball when everyone on Michigan's roster can find a running lane. Fitz: sadface. Jake Ryan had 3.5 TFLs and 1.5 sacks. Scheelhaase threw one INT but would have thrown more had Jibreel Black not broken his brain. Michigan State. Winning next week would go a long way to locking up the Legends division crown. It would all but knock MSU out of the running, leaving Iowa (2-0), Northwestern (2-1), and Nebraska (1-1) the only teams able to challenge for the title. I called this a 60/40 win for Michigan before the season and haven't seen anything to change that impression: Le'veon Bell is not terrifying despite what people will have you believe, Andrew Maxwell is incredibly raw, and the defense, as mentioned above, has now allowed 27 to Indiana, 20 to Notre Dame, and 19 to Iowa. It will be closer than you'd like, but Michigan should win comfortably. Fill in the sentence plz: Jake Ryan is/will be Michigan's best linebacker since (blank). I think after a rough start, Toussaint actually got on track a bit. His later carries were more, "one cut, get upfield," and he made the yards he could. Downfield blocking on Denard's runs were good, too. I'm actually less worried about him than before. Does seem to lack explosion though; balance is still there. You might be overrating the 2007 team. That defense was a lot less than the sum of its parts.